As a mom that strives to live as naturally and organically as possible, I am a HUGE fan of herbs, especially with the upcoming flu and cold season! My family has fought many illnesses and ailments with herbs and we have seen the difference it can make in recovery time! I am also a huge fan of midwives. I had midwives deliver all three of my children and I even had a homebirth for my 3rd child. I trust midwives and their vast knowledge of natural remedies! So that is why when I was introduced to Birth Song Botanicals, I knew it was a perfect fit for my family! Birth Song Botanicals’ mission is to produce high-quality herbal products that are effective, pure, and naturally safe for women and children. Birth Song Botanicals’ Core Values are to carry on the nourishing traditions of midwives and herbalists. They are bringing awareness about how easily herbs can be integrated into our daily lives and how they can enhance our well-being, health, and vitality. When we teach our children about the many benefits of herbs, we are cultivating a healthy future! I loved looking through their awesome selection of great herbal medicines for newborns, pregnant moms, breastfeeding and children! The minute I saw the Children’s Herbal Kit, I knew it would be perfect for keeping my children healthy this upcoming winter and all year long! This is a great opportunity to fill and establish your child’s herbal medicine chest. Cold and flu season is right around the corner! Having everything you need on hand before your child gets sick will save you tons of time, money, and suffering in the long run! STOMACH SOOTHER: This remedy is intended to support the digestive system, help with colic in a newborn and sooth an upset or nervous stomach. CHILDREN'S RESPIRATORY SUPPORT: Children love the taste of this sweet glycerine based tincture. This remedy is intended to support children's respiratory systems. CHILDREN'S DAILY IMMUNE: This remedy is intended to be used as a daily support to strengthen and protect children’s health and lungs during the cold season. I often suggest this remedy for the recovery phase of an illness as well. CHILDREN'S IMMUNE BOOST: An excellent choice to boost and strengthen your child’s immune system. The herbs in this combination are antibacterial in nature. They work with the body to promote wellbeing. CHILDREN'S TRANQUILITY: This remedy is wonderful for helping your child rest well and relax. Especially when teething is causing discomfort and restlessness. CHILDREN'S HEALING HERB BATH: Respiratory and immune support. 3-in-1 - Steam inhalant, gargle, and bath. HERBS FOR KIDS EBOOK AND RECORDING: Just how often do kids get sick? What can you do to prevent them from catching every bug that comes around? What herbs are safe for children? What conditions can be addressed with herbs at home? How much do you give them, and for how long? When should you take them to the doctor? CHILDREN'S WELLNESS POSTER: Learn 15 wonder herbs that are perfect for children! Plus, a How To Guide comes in your kit explaining how to use each product. We have already started using the Immune Boost and Daily Immune and I love them! I can definitely see us using every single item in the coming year! This is a great kit that has thought of everything to help kids with general and common illnesses that every parent will face with their children! Help them in a natural way with this great Herbal Kit from Birth Song Botanicals. 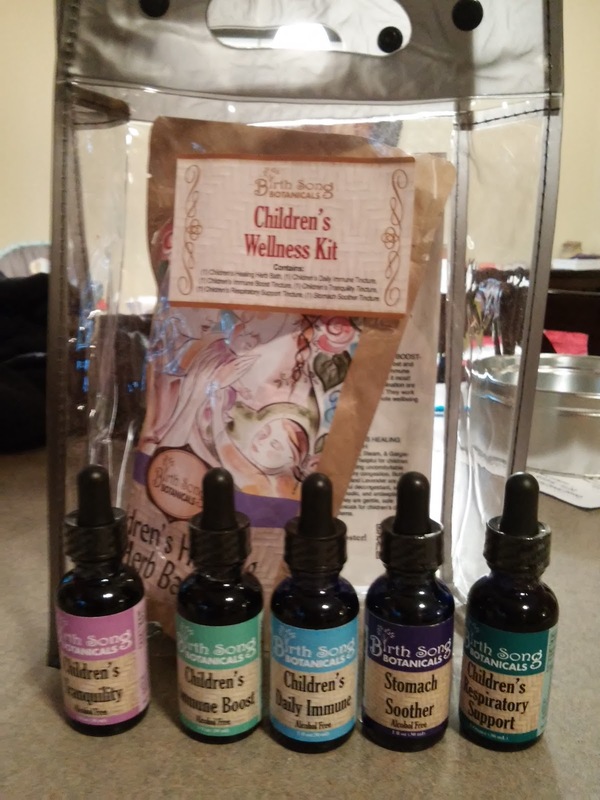 You can purchase the Children's Herbal Kit for $71 from the Birth Song Botanicals website. I love this! I have my kids taking some things to boost their immune system, but I would love to try this.